Sustainability is commonly defined as meeting the needs of the present without compromising the ability of future generations to meet their own needs. A founding signatory to the American Public Transportation Association (APTA) Sustainability Commitment, Metro is committed to adopting core processes that ensure ongoing environmental, social, and economic sustainability practices are continually improved over time. In 2013, Metro received gold-level recognition from APTA based on a review of sustainability indicators, and is one of only twelve transit agencies in the country to achieve gold-level status (as of March 2014). At Metro, we address sustainability in terms of both the services we provide and how we operate. Metro’s service guidelines identify areas of population and employment growth priority for increased transit service. Metro is also working with local jurisdictions to update obsolete parking standards to encourage more transit and pedestrian-friendly development, and participates actively in the Puget Sound Regional Council’s Growing Transit Communities initiative working to locate housing, jobs and services close to transit. Metro has aggressively pursued opportunities for resource conservation, completing various lighting and HVAC upgrades, utilizing an innovative “cyclone” recycling system for cleaning buses, and attaining LEED certification for all buildings constructed since 2007. Metro initiated an Environmental Sustainability Management System (ESMS) at the South Base and Component Supply Center campus in 2011. Metro staff actively participates on several county committees, including the Energy Task Force, Green Building Team and the Department of Transportation’s Equity and Social Justice team. Metro's motorbus fleet consists of diesel-electric hybrid, electric trolley and diesel buses. As of June 2015, approximately 70% of Metro's bus fleet was comprised of zero emission electric trolleys or diesel-electric hybrids. Metro's motorbus fleet is projected to be 100% hybrid or electric by 2018. These hybrid buses are up to 30 percent more fuel efficient than the diesels being replaced. 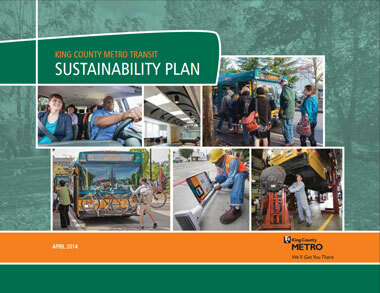 Trolley Fleet Replacement: Metro operates the second largest zero-emission, electric trolley bus system in the country with routes throughout King County. Metro is currently replacing its existing fleet of aging trolley buses with new buses that have regenerative braking and the ability to operate off-wire on battery power for short distances – reducing the need to substitute diesel and hybrid buses when construction affects routes along electric bus corridors. Battery Bus Pilot Project: Metro is testing an all-electric battery-powered bus with federal grant funds. Like the latest generation electric trolleys, battery-powered buses are more energy-efficient than internal combustion powered vehicles and hybrids. Electric Vehicle Subcomponents: Metro is initiating the use of electric subcomponents on transit vehicles by replacing components that are traditionally driven off belts and gears from the engine, such as cooling fans. Electric engine fan cooling systems are expected to improve fuel efficiency on buses by up to five percent. Additional benefits associated with these upgrades include better reliability, lower emissions, easier maintenance, and improved bus performance. Start-Stop Technology: Metro is deploying new diesel-electric hybrid coaches that, when stopped, turn the engine off and switch to battery power to reduce fuel use (similar to a hybrid passenger car). Metro’s Commuter Van Program is the largest publicly owned and operated rideshare commuter van program in the country. In 2014 the number of commuter vans in revenue service increased 3.4 percent to 1,412 vehicles. 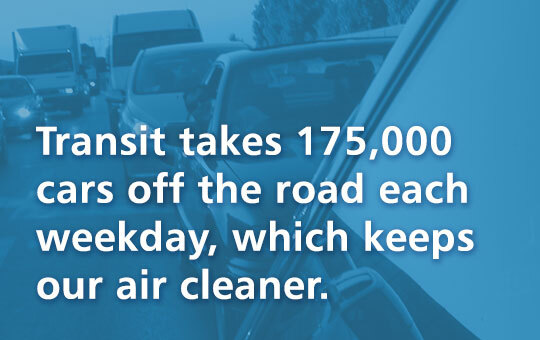 The commuter van fleet eliminated over 54 million vehicle miles traveled from Puget Sound roads and reduced approximately 21,000 metric tons of GHG emissions in 2014. This includes Metro’s all-electric, zero emissions metropool vehicles. A total of 25 new five-passenger Nissan LEAFs were added to the Commuter Van Program from 2011-2013 to establish the metropool fleet. 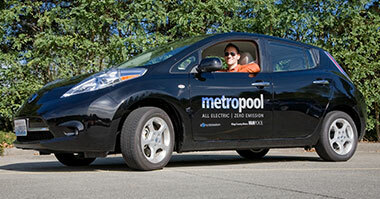 The metropool pilot program launched in 2011 and now has 25 all electric, zero emission Nissan LEAF's for use in Metro's vanpool fleet.